Church Street. Dusk. I’m watching a middle-aged man across the street, and he’s protesting. I want to say this was the summer of 1991 or ’92. 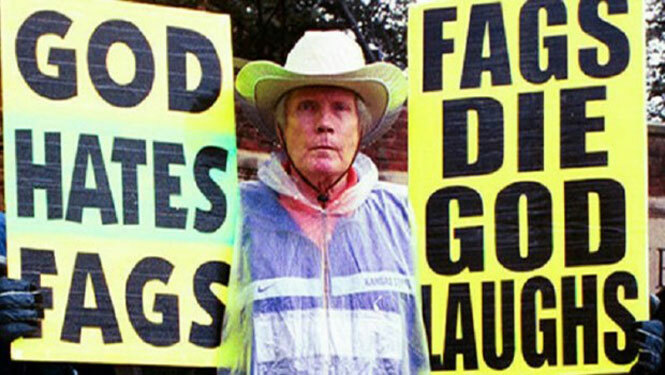 He doesn’t say a word, but he’s holding a sign in each hand. Both explain how much God hates degenerates, and how they’re all gonna go to hell. He’s wearing a white dress shirt, black pants; signs thrust up and out for everyone to see. He’s turning slowly one way, then the other, just below Alexander Street. It’s Saturday night. No street lights, yet, but there’s music throbbing, spilling out of a nearby bar, so the street has its own soundtrack. But this guy — he’s not here to party. This is a protest. At least he’s not violent, I think, as he’s not kicking heads in or screaming insults out of a car window. But people ignore him because what do you say to a guy like that? Then a younger man with long, black hair and tan skin happens by. He’s wearing a white dress shirt open over a white muscle shirt, with black slacks. He walks right up to the protester and stands uncomfortably close — I mean, nose-to-nose, right between the outstretched arms holding the signs up high — and he poses there, still as a statue. Fireworks, I’m thinking, but the middle-aged man says nothing and neither will he budge. This guy’s committed. He keeps the signs high, arms up and out. As long as he does that, he’s winning God’s war. How long can the two of them stand so close? Both are frozen. Both are silent. There’s only the music in the street. And then the thin man begins to dance in a way I recognize from that Madonna video. Yeah, they call it “voguing.” His fluid arms glide like water, swimming around the man’s belly, over his shoulders, under his arms, framing his face. The protester starts turning his signs again, slowly one way, then the other. The thin man turns with him and keeps dancing, right in his face. And I think, Yeah, that’s what you say to a guy like that. Jerry Schaefer is a Toronto actor and writer whose work has appeared on CBC radio and television. He also holds an Editing Certificate from George Brown College.